Indian 2-wheeler manufacturer Bajaj, when it released the Pulsar RS200 it was made available only in two colour combinations – red and yellow. 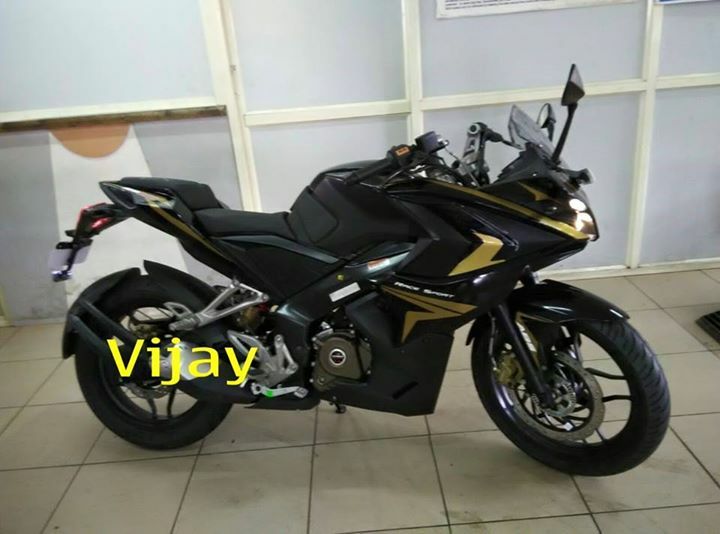 New reports and images reveal that a new black and golden colour combination of the bike has been spotted at a dealership here in India, which indicates a the RS200’s new color palette. A similar combination of colors was seen on the Bajaj Pulsar RS200 during the Racing Sport’s pre-launch activities at Bajaj’s famous Chakan plant. Bajaj Pulsar RS200 looks pretty elegant in black, with an interesting golden highlights on top of it. When it comes to visual appeal, the new colour tones down the busy aggressive styling, which has been criticised for being very overdone. The picture which you see in this article is the top-end, ABS equipped variant, which is priced at INR 1.30 lakh (ex-showroom Delhi). Under the hood, the Bajaj Pulsar RS200 is powered by a 199.5cc, liquid cooled, four valve, DTS-i Triple Spark Engine (which is based on Fuel Injection system) that churns out a maximum power of 24.5 PS @ 9750 rpm and a peak torque of 18.3Nm of torque. Bajaj’s very first fully faired motorcycle is selling quite well in the motorcycle market, with the manufacturer dispatching 2,000 units every month on an average. The introduction of black and gold can further shoot this number up.